Sub-adult, Santa Cruz County 9-inch adult moving on a November afternoon, Santa Cruz County. © Melissa Amarello Adult, found on a rock on an October afternoon in Marin County. Small adult, Santa Clara County. I have not yet discovered the origin of this warty condition or if it is known in this species. 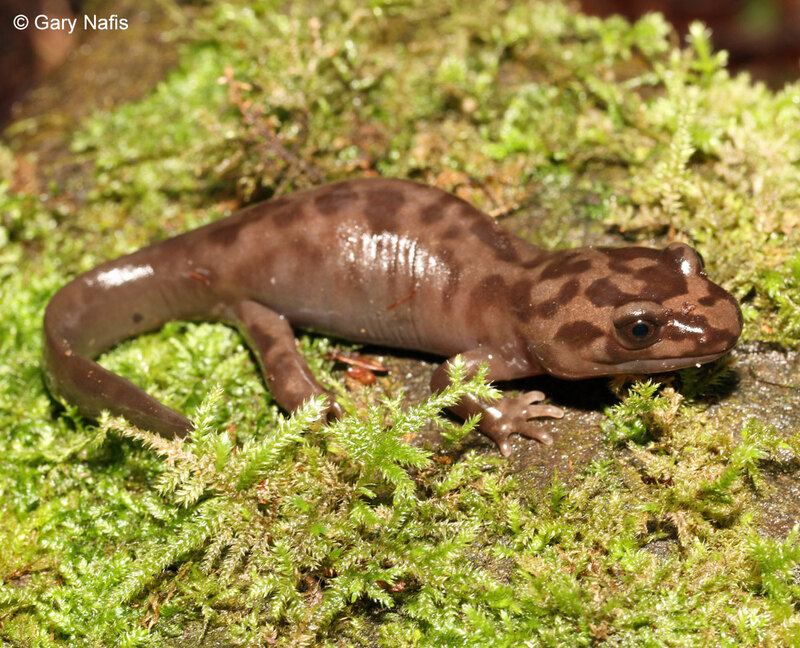 A similar warty condition has been found in California Newts found in San Diego County. That condition was determined to be from disease. Warty newts have also been reported on the San Francisco Peninsula. This is a smaller less-warty aquatic salamander from the same area in Santa Cruz County as the one to the left. © Abby Edwards Suzanne Cogen found this adult eating a Banana Slug at 3 PM in mid December in Sonoma County. Max Kelley found this adult eating a large rodent, possibly a Wood Rat, one late November day in San Mateo County. In this picture, only the rodent's long tail is still visible. © Max Kelley Nancy Gribler discovered this large adult eating a Banana Slug one night in her Marin County back yard. 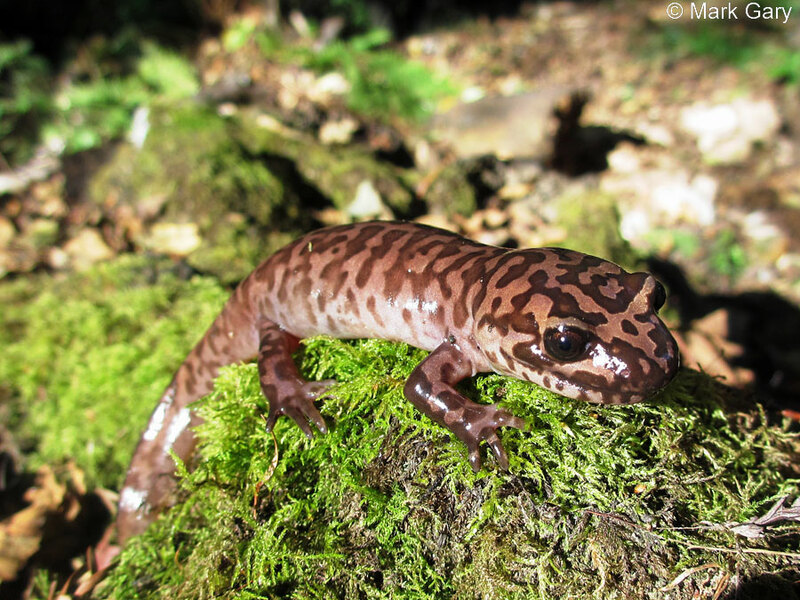 A short video of a juvenile California Giant Salamander in the Redwoods. This short video shows some of the sounds this salamander is capable of making. 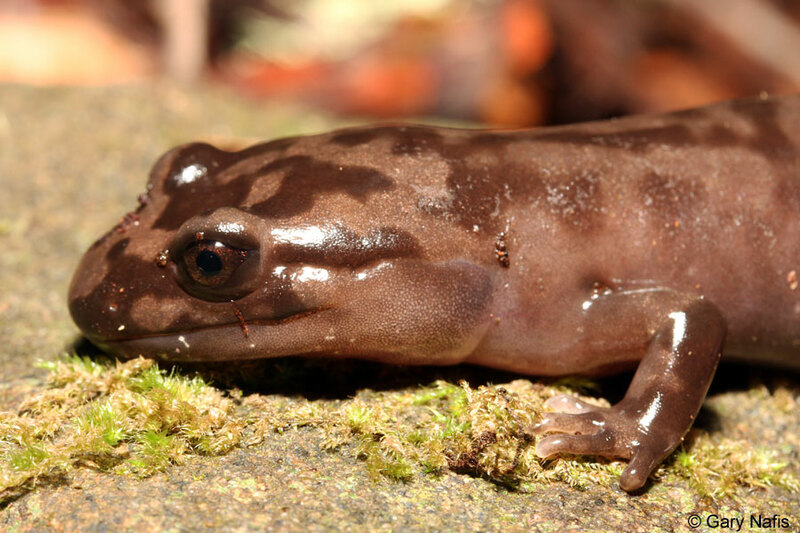 This is the sound of a juvenile California Giant Salamander in Sonoma County making noises while trying to crawl under leaf litter after being uncovered. There is noise of rustling leaves, but you can hear the salamander start off immediately with some clicks, followed by a louder chirp and then a more drawn out growl. After discovering this small adult hiding under a small fallen log in the Sonoma County redwoods, Jeff Rice and I set up our recorders and aimed our microphones. Then I gently picked it up with my thumb and two fingers grasping the sides of its body, firmly, but without squeezing so hard I was merely pushing air out of its lungs. The salamander squirmed from side to side and opened its mouth slightly. After about 10 seconds it made the chirping sound that you can hear here. This species is capable of making a farily loud sound, but this one was very quiet, so there is a lot of background noise from a running creek nearby. 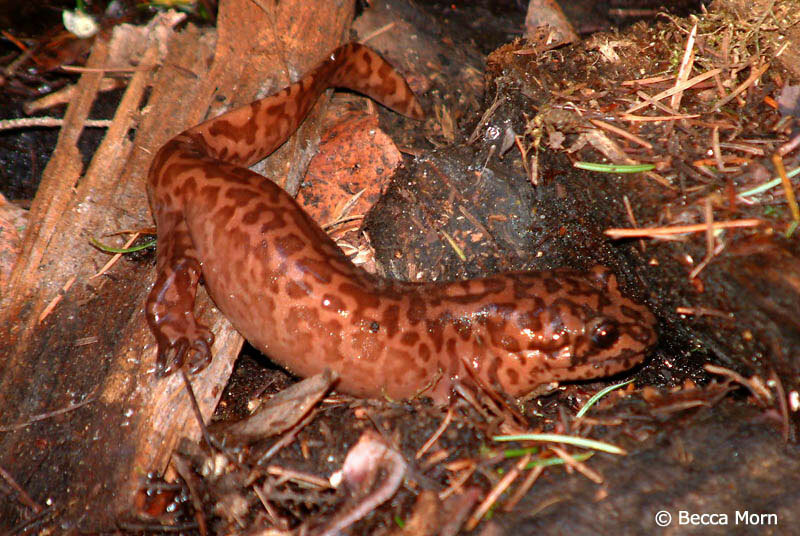 A hiker in mid February observed this huge adult CA Giant Salamander walking on a dirt trail at 1 PM in Santa Cruz County. He had no idea what it was when he got close with his video camera, and was startled to hear a loud rattling bark - and the camera movement shows it. You can just barely see the salamander opening its mouth as it produces this first roar. Then we can hear the salamander making some more raspy rattling sounds as it stands in a defensive posture. After using this site to identify the huge mysterious rattling beast he saw in the forest, he sent me the video so that we can all admire this salamander's performance. Adults are 2 1/2 to 6 4/5 inches long (6.25 - 17 cm) from snout to vent, 6.7 - 12 inches (17 - 30.5 cm) in total length. One of the largest terrestrial salamanders in North America, with a large robust body, a massive head, and stout limbs. Transformed adults have 12 - 13 indistinct costal grooves. The tail is flattened from side to side to facilitate swimming. Larvae are stream-type with tail fins that extend forward only to the hind limbs. There is often heavy black mottling. Gills are short, bushy, and dull red. Light reddish brown coloring above is overlaid with copper-colored marbling. The venter is whitish or dull yellow, usually unmarked. 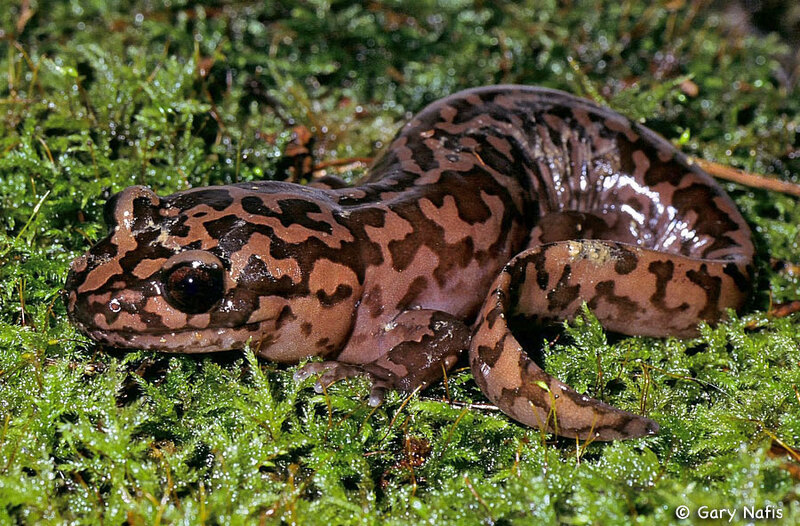 Dicamptodon tenebrosus, Coastal Giant Salamander, is very similar in appearance to D. ensatus. As far as I can determine, the only field mark that is useful to tell one species from the other is the presence of marbling on the chin and throat of D. ensatus, which is absent on D. tenebrosus, and possibly the underside, which is whitish on D. ensatus and gray to tan on D. tenebrosus. smaller head, shorter limbs, fewer teeth in the uper jaw, a darker body color both dorsally and ventrally, and the marbling pattern tends to be finer. Stebbins, 2003, says that the "dark marbling and flecking usually does not extend onto underside of throat and limbs" and that there are "dark flecks and blotches on throat and underside of legs" of D. ensatus and that "Marbling on chin notable in southern part of range." "Marbling or blotching on lower jaw often extends onto the chin, throat and underside of the forelimbs and pectoral girdle." "Adult Coastal Giant Salamanders do not have marbling that extends beyond the lower jaw onto the chin or throat. A member of family Dicamptodontidae - Giant Salamanders, and the genus Dicamptodon - Pacific Giant Salamanders, whose members are large in size with heavy, stocky bodies. - Larvae are born in the water where they swim using an enlarged tail fin and breathe with filamentous external gills. - Aquatic larvae transform into four-legged salamanders that live on the ground and breathe air with lungs. Neotenic adults which retain their gills and continue to live in water are found in many populations. These gilled adults may outnumber transformed individuals. Little is known about the natural history of D. ensatus, much of which is presumed from studies of the similar species D. tenebrosus. 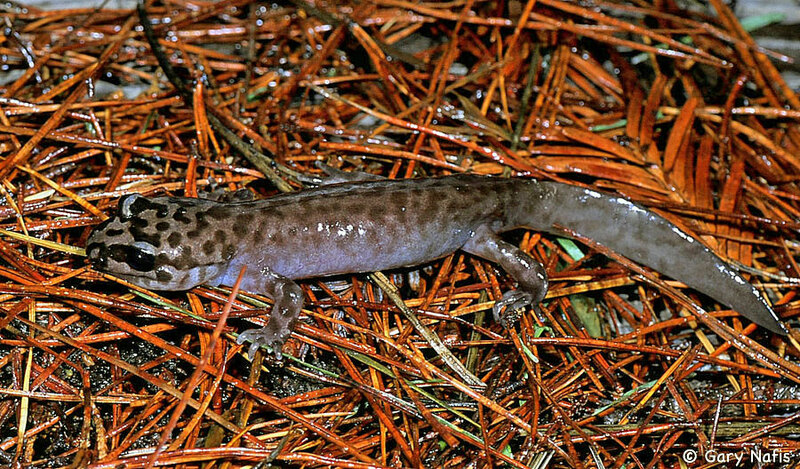 This salamander is nocturnal, but also active in daylight in wet conditions. Transformed animals forage on the forest floor on rainy nights, and during daylight in wet periods in winter. They can be found walking across roads on rainy nights, especially with the first heavy rains of the fall, usually in November. Adults are also found under cover objects such as rocks, logs and artificial cover. 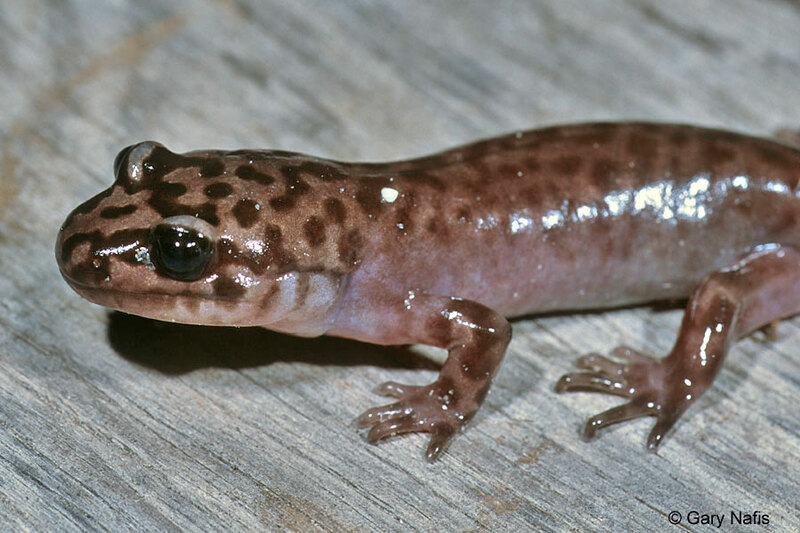 This salamander often produces a vocal sound when threatened, which is a low rattling bark-like sound. 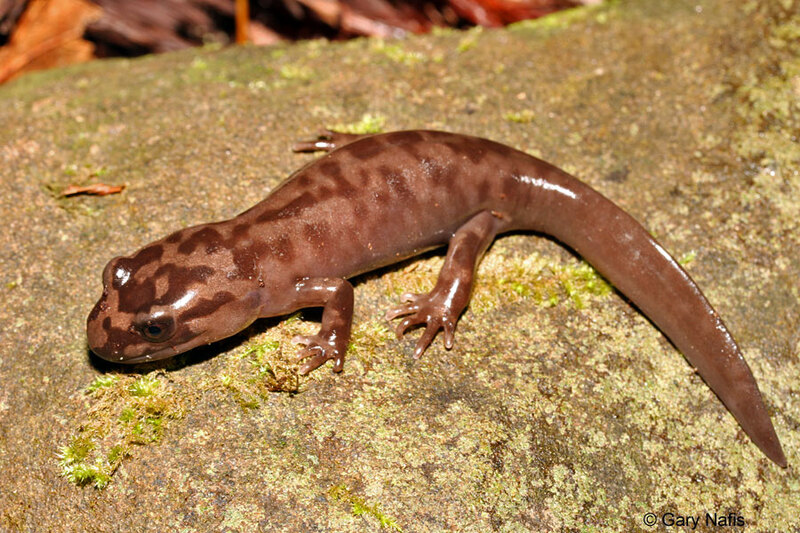 According to Stebbins and Cohen, 1997, the Coastal Giant Salamander has "...vocal cords and can bark or rattle. Its sounds are thought to startle predators." Large adults are capable of delivering a painful bite. Presumably, the diet consists of anything small enough for a salamander to overpower and eat, including slugs and other invertebrates, and small vertebrates such as salamanders, small rodents, and lizards. Eggs or embryos have been found in large larvae and terrestrial adult giant salamanders. Giant salamanders are sit-and-wait predators. When prey comes near they lunge quickly to grab the prey with their mouth and crush it with their jaws. Aquatic larvae probably have a similar diet to the larvae of Dicamptodon tenebrosus, which consists of small aquatic invertebrates and small fish hatchlings. According to Petranka, 1998, regarding Dicamptodon ensatus: "Information on the mating season and courtship behaviour is not available." The information here regarding breeding, eggs, and young, is mostly taken from our account of the similar species Dicamptodon tenebrosus. Reproduction is aquatic. Fertilization is internal. Females reach sexual maturity in 5 to 6 years. Breeding occurs mostly in spring, usually in May, but later in the hear at high elevations. Breeding may also occur in the Fall. Terrestrial males and females move from their terrestrial hiding places to a stream in which to breed.. According to Nussbaum et al, 1983, observations of Dicamptodon in captivity and in the field suggests that courtship takes place in "hidden water-filled nest chambers beneath logs and stones or in crevices. Males deposit up to 16 spermatophores.... Females pick up one to a few of the sperm caps with their cloacas and deposit their entire clutch of 135 to 200 eggs (larger females deposit more eggs) in the nest chamber. The eggs are attached singly, side-by-side, usually on the roof of the nest chamber." Only a few nest sites have been observed in the wild. The female stays with the eggs to guard them until they hatch, usually in November and December, or in 6 to 7 months, during which time she does not eat. A female probably does not breed more than once every two or more years because of the long time she spends with her eggs. "The function of maternal care is not fully understood, but prevention of egg cannibalism seems to be one function." Eggs or embryos have been found in large larvae and terrestrial adult giant salamanders which indicates that they are a theat to a nest site. Larvae hatch in water and transform to a terrestrial form in probably about 18 - 24 months after hatching, depending on environmental conditions and the size and permanence of the stream. Larvae live on their yolk for 3-4 months after hatching then they feed on invertebrate prey and small amphibian larvae. Some larvae may overwinter and transform in their third year. Young larvae are found in still water near the shoreline, often under small rocks and leaf litter. Older larvae are found in the main stream channel. Larvae are more abundant than transformed adults. Larvae can be found exposed in the water at the edge of a stream at night by shining a light at the water. Recently metamorphosed juveniles move out of streams to the surrounding habitat during wet periods. Occurs in wet coastal forests in or near clear, cold permanent and semi-permanent streams and seepages. One population has been found inhabiting flowing water in a network of caves. Endemic to California, found in two, possibly three isolated regions, from Mendocino County near Point Arena east into the coast rages into Lake and Glenn counties, south to Sonoma and Marin Counties, continuing south of the San Francisco Bay from San Mateo County to southern Santa Cruz County. Does not occur east of the SF Bay. There is an old unconfirmed sight record from Big Sur, Monterey County. Occurs from sea level to near 3,000 ft. 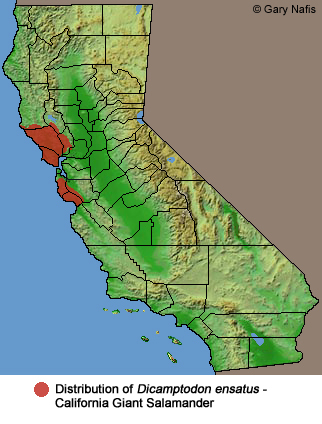 The genus Dicamptodon as split into three species when evidence showed that salamanders from the south Bay area to Sonoma County were genetically distinct from those to the north and from animals in Idaho and Montana. The southern species became Dicamptodon ensatus - California Giant Salamander, the northern species became Dicamptodon tenebrosus - Coastal Giant Salamander, and the eastern species became Dicamptodon aterrimus - Idaho Giant Salamander. 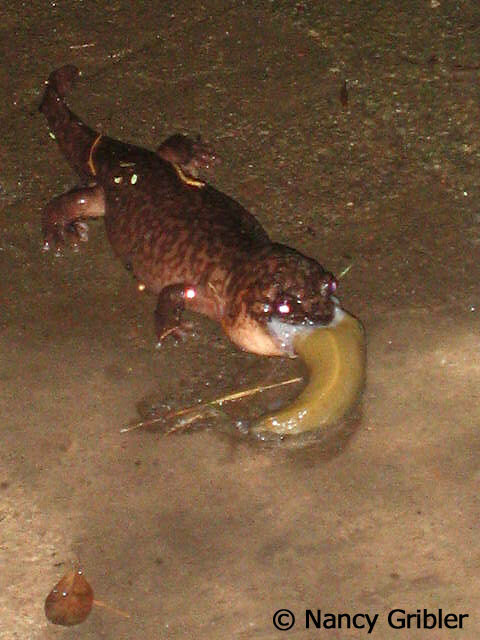 In a letter dated January 2006, Sinervo says that it is likely that these salamanders represent a genetically distinct population segment that is different from surface populations just outside the cave. He needs to analyze the DNA of more salamanders in order to determine how distinct they are, but due to the drought present before 2016 which caused no water to flow into the caves, specimens have not been available. Protecting the unique environment in the caves should be a priority until the lineage of the salamanders can be determined. 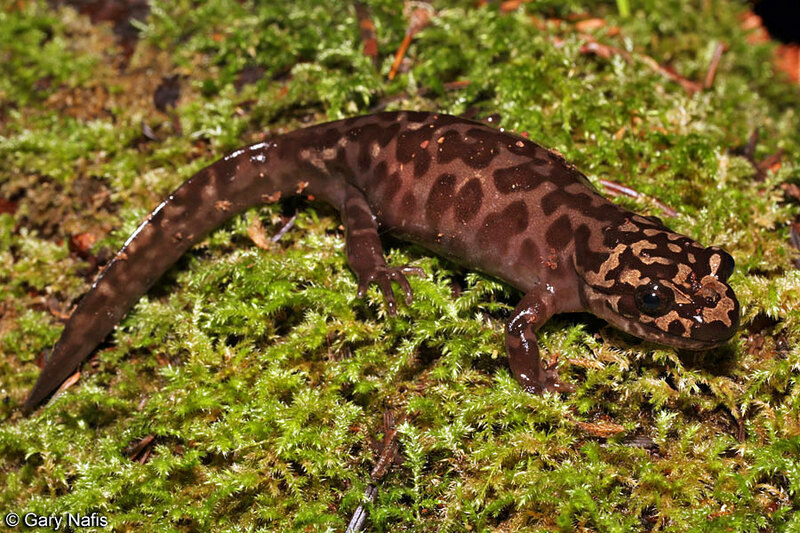 Articles about this population have been published in a number of Santa Cruz sources, including the Santa Cruz Sentinal in 2006, which is apparently no longer online, and those listed below, but none have ever shown a picture of the salamanders. There is not much evidence to show that the current distribution of this species is different from the historical distribution, however extensive habitat alteration in its range has most likely destroyed some populations. Forest removal and road building near streams has reduced the number of larvae of the similar species Dicamptodon tenebrosus, while opening of the forest canopy over streams may also be temporarily beneficial to the larvae. Protected from take with a sport fishing license in 2013. Dicamptodon: Greek - two curved, bent teeth, referring to doubly curved teeth. ensatus: Latin - sword-shaped, possibly refers to the pointed teeth. Stebbins, Robert C. and Nathan W. Cohen. A Natural History of Amphibians. Princeton University Press, 1997. At moderate risk of extinction due to a restricted range, relatively few populations (often 80 or fewer), recent and widespread declines, or other factors.